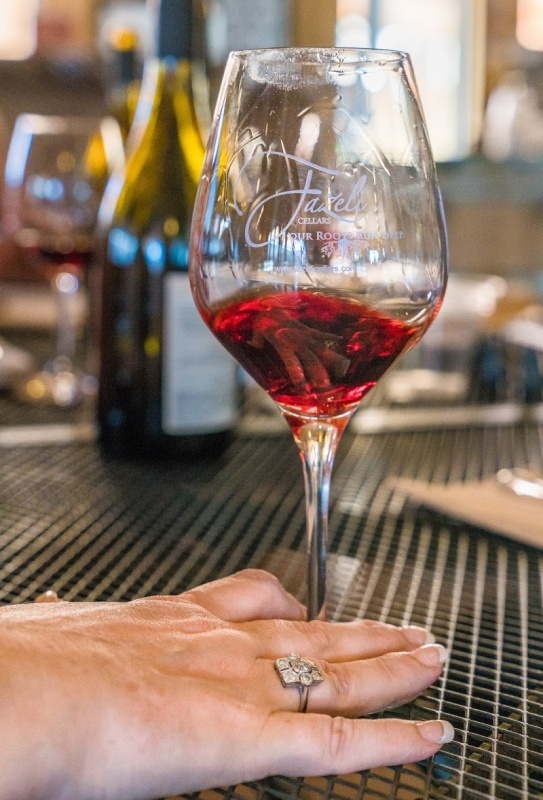 Our second day in Temecula began with a visit to Fazeli Cellars, on the De Portola Wine Trail. Twin staircases curved up from the parking lot to a large covered patio. To the right of this area was a spacious, airy tasting room with a large bar. 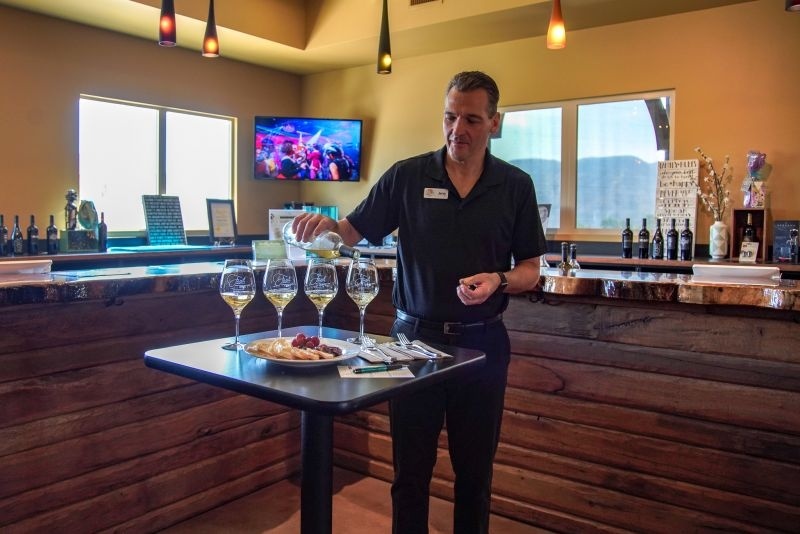 The facility is built on a hill, so it offers spectacular views of the valley and vineyards spread out below. We were met by Jerry, a Senior Manager at the winery. Membership at Fazeli has its benefits. 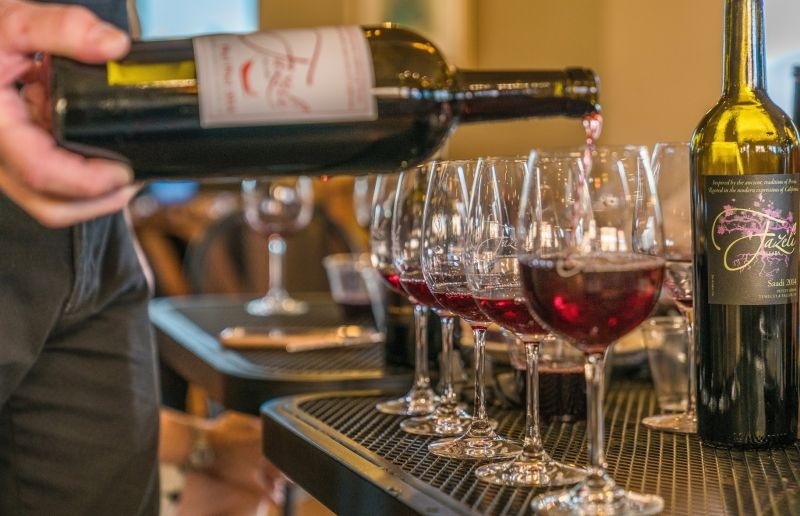 Fazeli has a full kitchen onsite so that you can pair food with a tasting, or eat dinner. At weekends they have live music on the patio. 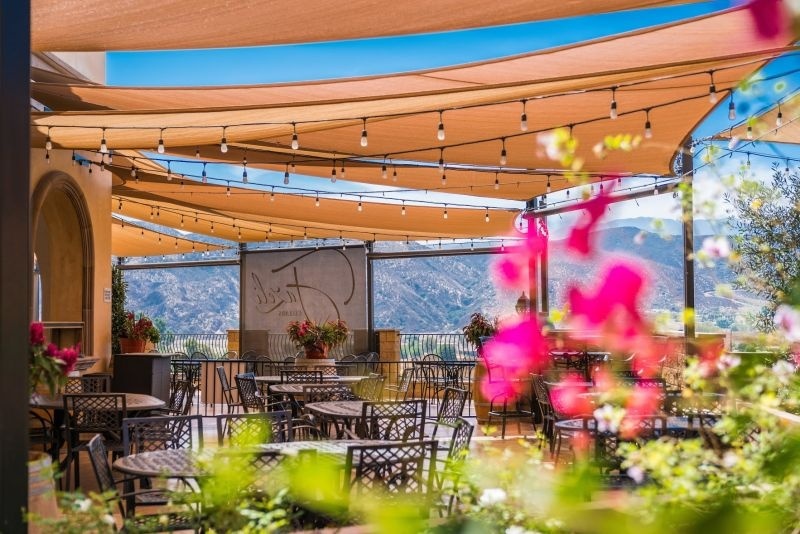 There is a members only area on the patio, a members-only room that offers full table service, and a members terrace outside the room that looks out across the valley. This arrangement allows members to listen to the music, if they wish, or enjoy the wine quietly. 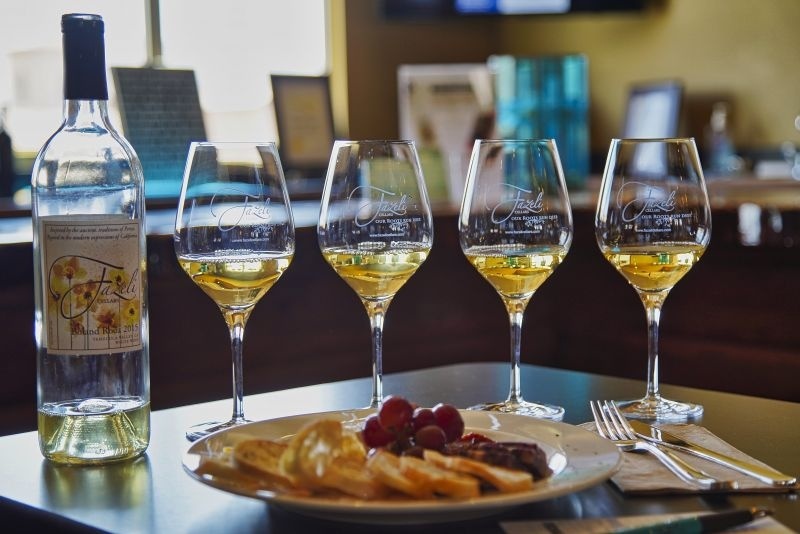 We started our tasting with a sip of a white wine blend: 80% Roussanne, 20% Marsanne. This opening taste gave us a clue to the main inspiration for the style of wines that Fazeli make; they draw inspiration from the Rhône. There are appellations in the Rhône in which these two grapes are the only varieties from which white wine can be made. The nose was of melon, quince, and canned tuna. The light-bodied wine led with the crisp acidity of green apple with a smattering of nuts. This was an unremarkable wine, albeit at a reasonable $26 a bottle. Amber Comments: I was impressed with the wines from Fazeli but this one sadly left me flat. It was the only thing I tasted there I didn’t enjoy. 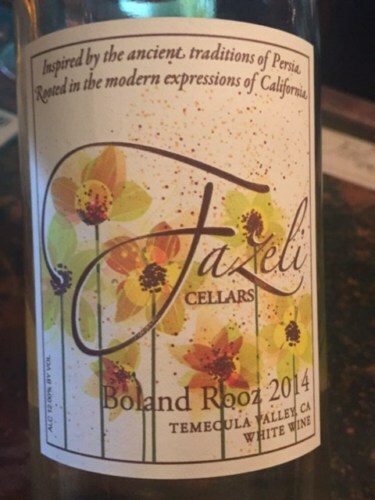 The white blend was called Boland Rooz; which I translate from Persian as “Long Day” the name for the Summer Solstice. Several of the wines from Fazeli have Persian names, reflecting the heritage of the owner, Bizhan “BJ”, Fazeli. 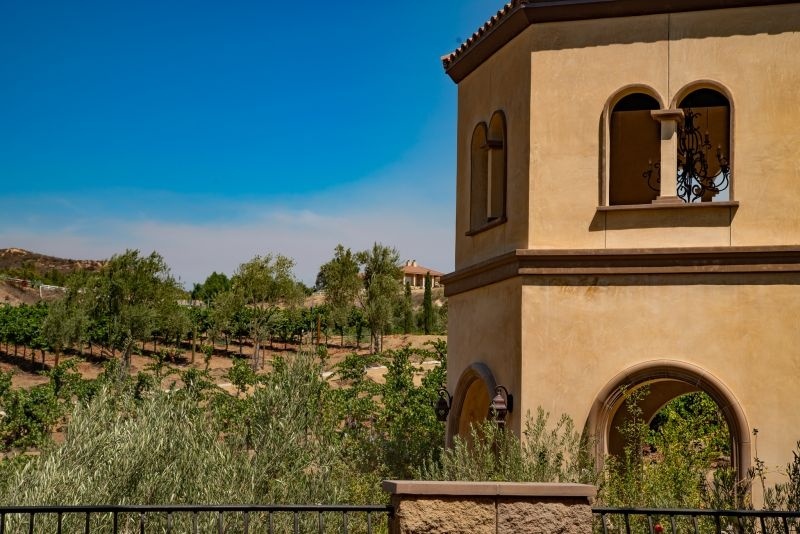 The wine labels bear the legend of “Ancient traditions of Persia rooted in the modern expression of California.” and the style of the winery and tasting room pay homage to Persian architecture. The food served is a fusion of Middle Eastern and California cuisine; the Persian Tacos being a fine example of said approach: beef Kobideh, inside Lavash bread with pickled onions, Sabzi salad & drizzled with mast o Musir. The next wine was the 2009 Shiraz (Syrah). The wine has 78% Shiraz, 12% Grenache, and 10% Mourvedre. It sells for $52 but is available only to wine club members. The nose was intense loaded with aromas of blackcurrant. The flavour was a complex mix of blackcurrant and pepper; menthol emerged in the finish and the fruit and spice were balanced by laid-back tannins. We followed this with a taste of the current release; the 2015 vintage ($48). A less intense nose, with fruit notably more restrained, allowing wood and pepper notes to emerge. The wine offered a medium body with pepper dusted cherries and a long finish that had a touch of cherry. Amber comments: The menthol on the nose was a little astonishing. I enjoyed my sip, and it would be absolutely wonderful paired with lamb. I think the food would really bring out its beauty. Next up was the 2012 Mehregan ($35); Grenache with 2% Syrah. The wine was a translucent light ruby in colour. The nose was low intensity, but complex; subtle fruit intertwined with baking spices. The wine was bright with tastes of cherry, raspberry, and pepper. The wine’s name is a reference to the Persian Festival of Autumn and it would be an ideal wine to pair with Thanksgiving turkey. Amber comments: I could really taste Fall in that glass of wine. It was fabulous and, for the price, it’s a steal! The fifth wine was the 2014 Saadi ($58), named for Abū-Muhammad Muslih al-Dīn bin Abdallāh Shīrāzī, a Persian poet known as Saadi. The wine is a blend of 80% Petite Sirah, 18% Shiraz, and 2% Cinsault. The nose was intense; plum with a whiff of barnyard. That slightly worrying note on the nose was not reflected once we took a sip; far from it as this was a complex wine that impressed us. Rich, with cherry and heavy tannins that led to a long fruit laden finish. Amber comments: This sip was one that I had to think about. It’s unusual and in my opinion, needs a little time to really come into its own. Having said that, in two years, it will have a chance to balance out and you will have a wine that will be a stunner. The next wine was offered after I had look at the label and seen the blend of the Saadi. Amber and I enjoy Cinsault but it is not a common variety in California. I asked whether Fazeli made a Cinsault focused wine. The affirmative response came in the shape of the 2014 Phel Phel ($35). The wine is 95% Cinsault and 5% Syrah. The name means spicy; hence the label bears a picture of a chili bean. I wonder if there is a common linguistic heritage to the Portuguese Piri Piri. The nose was intense and bright with plum and cassis. The luxuriant, soft mouthfeel was replete with plum, dark fruits, and raspberry. My question about Cinsault had been answered in a delicious manner. Amber comments: This was my favorite taste of the day. I was wowed! The layers of flavors in my glass were gorgeous. I wanted to sit with that glass and enjoy the beautiful wine and the beautiful day. This is a wine not to miss out on when you visit. Truly wonderful. 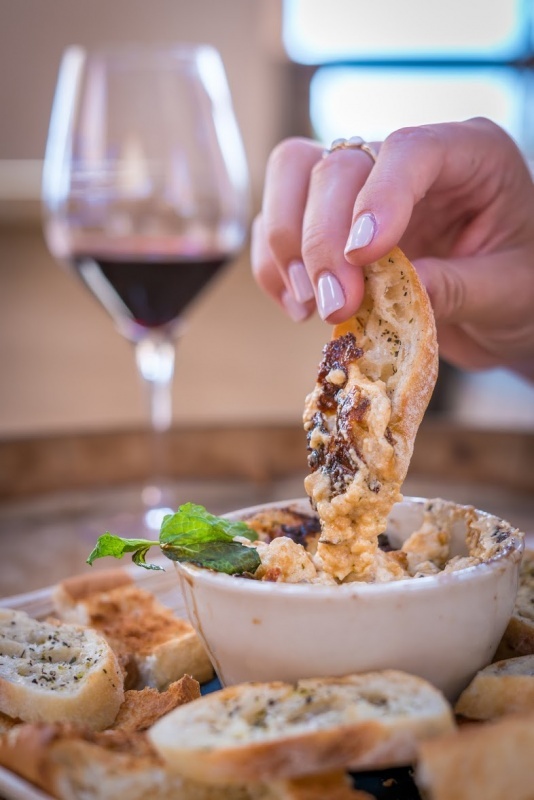 The combination of setting combined with the comfortable seating to enjoy music, wine, and food led Amber and I agree that if we lived in Temecula we would become club members at Fazeli. 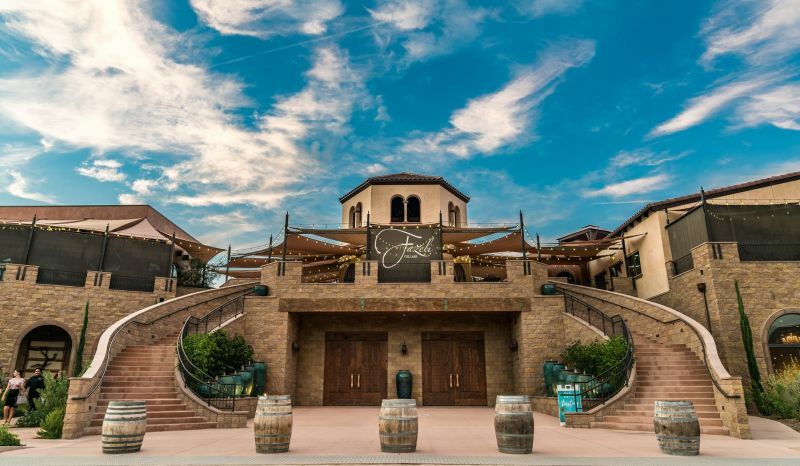 This was another winery that provided further evidence that Temecula wine offers quality and a variety of styles. 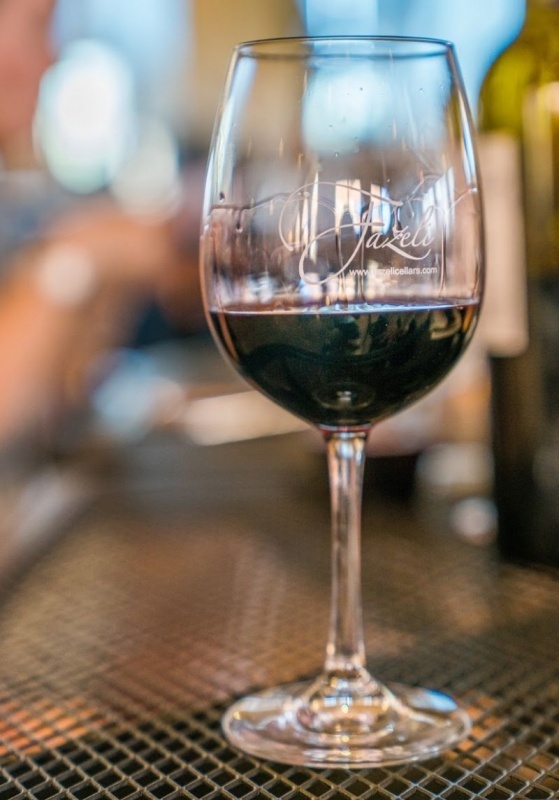 Amber comments: If you would like to read more about wines from Temecula, check out our post about Palumbo Family Vineyards and Baily Vineyard and Winery. 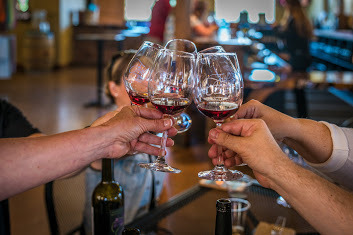 Sponsored Post: We received a complimentary tasting in exchange for an honest review. All thoughts and opinions are our own.